From the IEP Wizard Quick Resume Menu, select IEP Wizard Transition Goals. 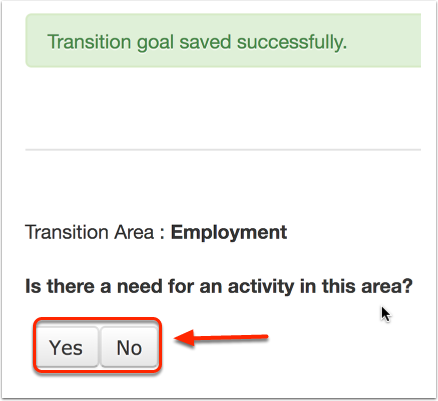 To create a Transition Plan click "Yes." 1. Agency Invited: If an agency representative was not invited enter the reason in the text area. NOTE: The requirement to add an explanation will ONLY SHOW if an agency representative was not marked as being invited. 2. Student Invited: If a student was not invited a rationale for explanation of why student was not invited will be required. 3. Student Attendance: If a student was marked as not being in attendance, enter the steps taken to ensure that the student had input into his/her preferences/interests and goals. 1. In the provided field enter information about the student's preference(s) and interest(s) for additional education and training after high school. Include type/name of date tool used, date given and results (updated annually and denoting any growth, etc. from one year to the next). 2. Enter the student's Post-Secondary Education and Training goal(s). Note: Clicking Next will automatically take you to a page inquiring if there are activities needed in order to prepare the student for his/her Post-Secondary Education and Training Transition Goal. 1. 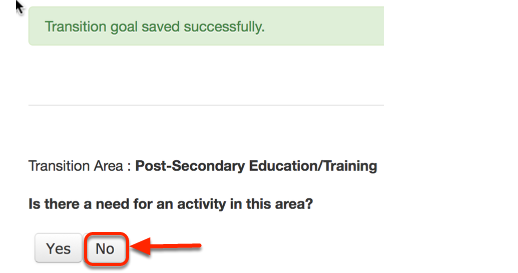 After successfully saving the Post-Secondary Education/Training Goal a green dialogue box indicating, "Transition goal saved successfully" will appear at the top of the page. 2. 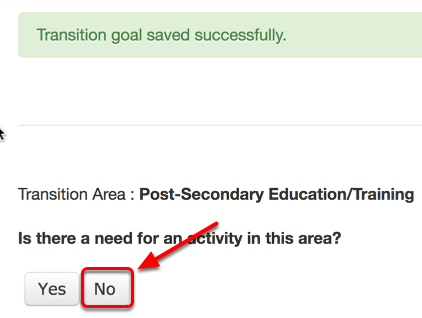 By clicking Yes or No, indicate whether an Activity is needed to help the student reach his/her Transition Goal. 1. From the drop down menu select the category to which the Activity best applies. 2. Describe the Activity in the provided field. 3. Document the Person/Agency Responsible in the provided field. 4. Using the Date Picker select the Timeline For Completion. Note: The System will ask if there is a need for another activity in this area once you have selected Save. 1. 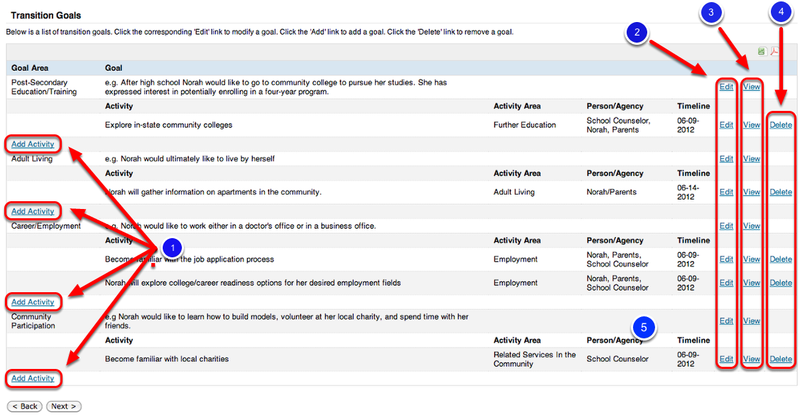 If No is selected when determining whether an Activity is required for Post-Secondary Education/Training Transition Goals, you will be taken to the Employment Preference/Interest(s) Goal Page. 1. In the provided field enter information about the student's preference(s) and interest(s) for employment. Include type/name of date tool used, date given and results (updated annually and denoting any growth, etc. from one year to the next). 2. Enter the student's Employment goal(s). Note: Clicking Next will automatically take you to a page inquiring if there are activities needed in order to prepare the student for his/her Employment Transition Goal. 1. 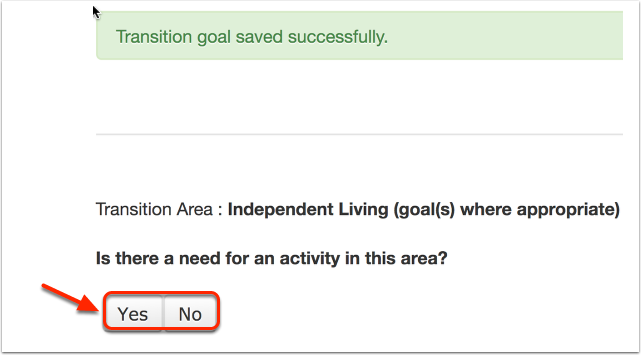 If No is selected when determining whether an Activity is required for Employment Transition Goals, you will automatically be directed to the Adult Living (Community Participation) Transition Goal page. Adult Living/Community Participation Preference/Interest(s) Goals (where appropriate) Page. Note: Clicking Next will automatically take you to a page inquiring if there are activities needed in order to prepare the student for his/her Independent Living (could include community participation) Transition Goal(s). 1. From the drop down menu select the appropriate option (i.e. Adult Living, Daily Living, Functional Vocational Programming, Employment, etc.). 2. In the text box provided include a description of the Activity. 3. 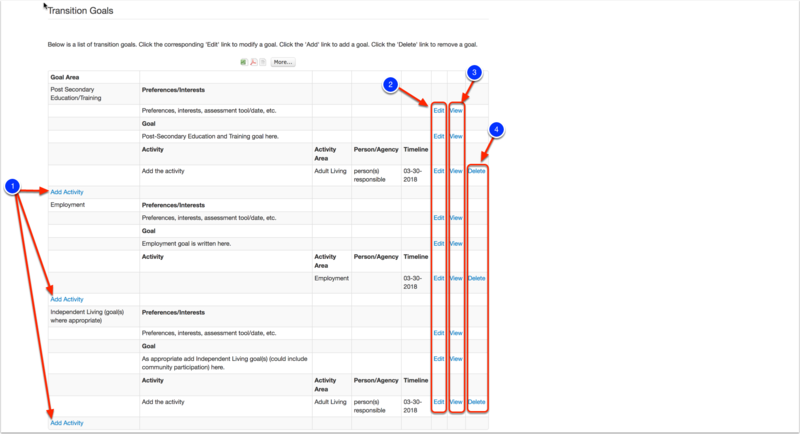 Indicate the Person/Agency Responsible for ensuring that the Activity is completed. 4. Using the Date Picker Icon indicate the Timeline for Completion. 1. 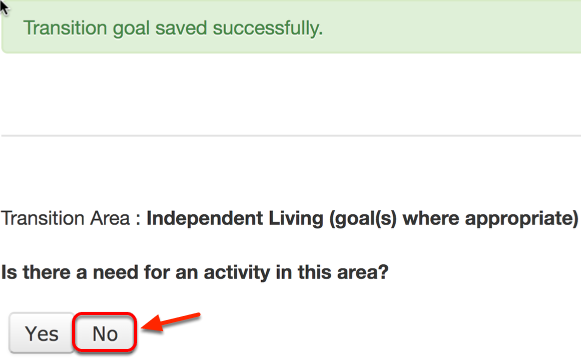 If No is selected when determining whether an Activity is required for Independent Living Transition Goals, you will automatically be directed to the Transition Goals Summary page. 1. 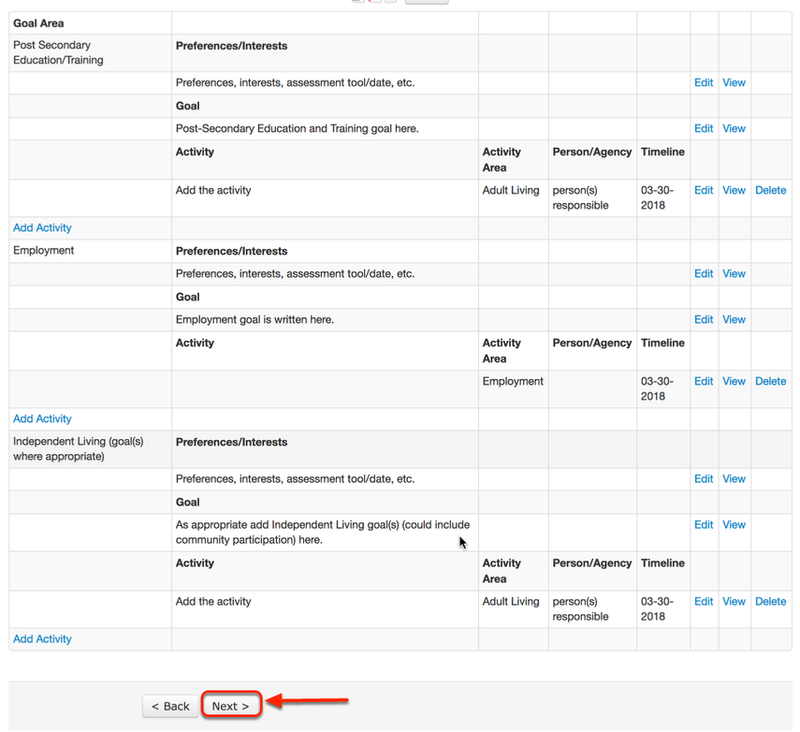 Click the Add Activity link to add additional activities to the respective Transition Goal area. 2. Click the Edit link to modify a Transition Goal or Activity. 3. Click the View link to view the Transition Goal or Activity in "read only" format. 4. Click the Delete link to remove an Activity. Note: You cannot remove the Preferences/Interests and Transition Goals areas, as they are a required portion of a Transition Plan; however, you may modify any goals by clicking the Edit button as well as add any additional Activities from the IEP Wizard Transition Goal Details page. 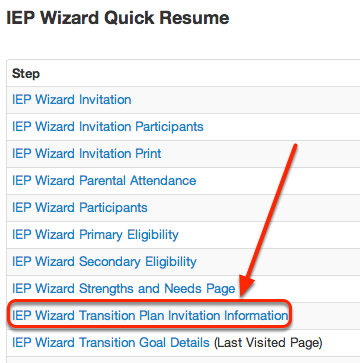 Review the IEP Wizard Transition Goal Details page to ensure that all information has been included and is accurate. Once you have reviewed the Transition Goals and you are now ready to proceed to the next step in the IEP Process (i.e. Course of Study). 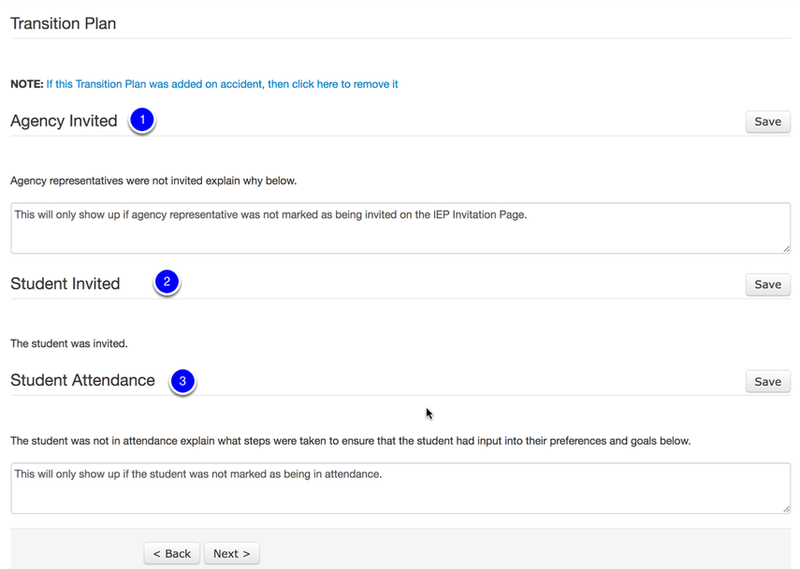 Click the Next button to continue to the Course of Study portion of the IEP. For more information on how to complete the Course of Study section of the IEP see the, "Determine Course of Study" lesson in this manual.